Song of the day: Flap! – "The Boogieman"
Today’s post comes to you courtesy of an Australian music publicity company called Heapsaflash who told me about a band and their album. The band is called Flap!. Musically, they’re nowhere near modern pop – or rock for that matter. They’re not influenced by the Eighties, or the Seventies, or even the Sixties. “OK,” I hear you ask, “how far back do they go?” Well, they play music in the vicinity of the Jazz Age, because the band sound as if it’s playing in some club somewhere in the Roaring Twenties. Come to think of it, there are a few Australian bands nowadays that are mining this early, pre-electric era of music-making. (There’s also The Harry James Angus Band and C.W. Stoneking among others.) I don’t quite know why this very, very old sub-sub-genre of music has popped up in Australia in the last couple of years, but it seems to be a burgeoning thing. In a happy coincidence, I’m currently watching an Australian television program called Miss Fisher’s Murder Mysteries. It’s set in Melbourne in 1928. Miss Fisher is a woman of independent means who lives life gaily whilst solving murders. The show’s on every Friday night, and I’m loving it because it evokes the era wonderfully. The music of Flap! fits right in with Miss Fisher and her mysteries. That could be one reason why I enjoyed their album. 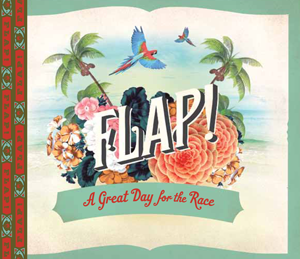 The album, A Great Day For The Race, is Flap!’s second (or as Americans have a habit of saying, “sophomore”). I must admit that, as with the band name, I had a way-off-base first impression. I thought the band meant that it was a great day for the human race, but then realised it must mean a race around the world. Oh, before I forget: I want to mention three things Flap! and their album reminded me of. I like it. It’s fun. You are currently browsing the archives for the Paris Combo category.